For the first time, astronomers have detected an atmosphere around a small (and likely) rocky exoplanet orbiting a star only 39 light-years away. 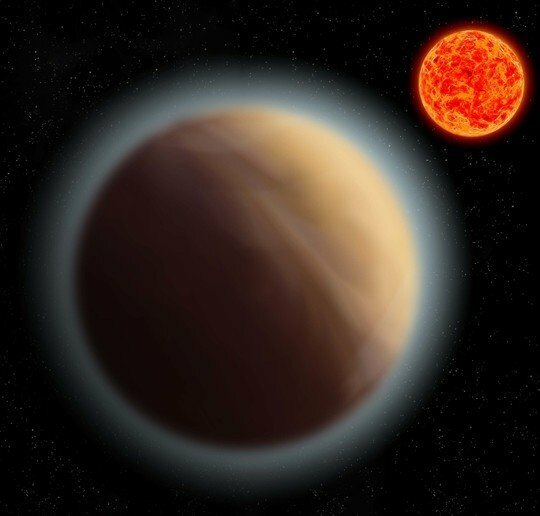 Although atmospheres have been detected on larger alien worlds, this is the smallest world to date that has been found sporting atmospheric gases. Alas, Gliese (GJ) 1132b isn’t a place we’d necessarily call “habitable”; it orbits its red dwarf a little too close to have an atmosphere anything like Earth’s, so you’d have to be very optimistic if you expect to find life (as we know it) camping there. But this is still a huge discovery that is creating a lot of excitement — especially as this exo-atmosphere has apparently evolved intact so close to a star. Through precision observations of the infrared light coming from the exoplanet during the 1.6 day transits, the astronomers noticed that the planet looked larger at certain wavelengths of light than others. In short, this means that the planet has an atmosphere that blocks certain infrared wavelengths, but allows other wavelengths to pass straight through. Researchers of the University of Cambridge and the Max Planck Institute for Astronomy then used this information to model certain chemical compositions, leading to the conclusion that the atmosphere could be a thick with methane or water vapor. Judging by the exoplanet’s close proximity to its star, this could mean that the planet is a water world, with an extremely dense and steamy atmosphere. But this is just one of the possibilities. Although we’ll not be taking a vacation to GJ 1132b any time soon, the discovery of an atmosphere around such a small alien world will boost hopes that similar sized super-Earths will also host atmospheres, despite living close to red dwarf stars that are known for their flaring activity. If atmospheres can persist, particularly on exoplanets orbiting within a star’s so-called habitable zone, then there really should be cause for optimism that there really might be an “Earth 2.0” out there orbiting one of the many red dwarfs in our galaxy.